EXCLUSIVE: Get £15 of free beer, in a Gatwick bar, with Priority Pass or Lounge Club! OK, this is a weird one. But I can’t help thinking that it will be welcomed by some Head for Points readers! Priority Pass and Lounge Club, the airport lounge access cards, have opened a new lounge at Gatwick South. Remember that British Airways moved to Gatwick South two weeks ago, so this is very timely. The new lounge is …. a bar. To be precise …. The Grain Store Cafe & Bar. Obviously this is not an airport lounge. It’s a bar. In an airport. The terms and conditions are simple. 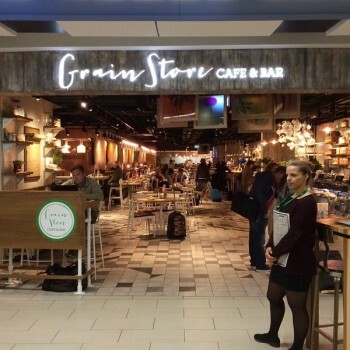 Turn up at The Grain Store Cafe & Bar, flash your Priority Pass or Lounge Club card, and you will receive £15 per person off your bill. You can charge as many guests as you like to your pass, although you will obviously be recharged later on if you are beyond your guesting limit. This is quite tempting. I have an American Express Platinum card which comes with two free Priority Pass cards. Each allows me a free guest. If my wife and I turn up at The Grain Store Cafe & Bar with our kids, we will get a £60 discount on our bill. And if we’re still hungry or thirsty, we can pop into the No 1 Lounge anyway ….. This is also a decent way of using the two Lounge Club passes that come with American Express Preferred Rewards Gold. ‘Take out our card and get £30 of free beer’ – now that’s a selling point! Thanks to Jeremy for this. We are planning to so the same in May. And they now accept HSBC elite Lounge key, so even more options for those who use that too. So nicer breakfast at grain store, followed by no 1 lounge some drinks etc.. Should be nicer experience flying from LGW now.